Hello, I. 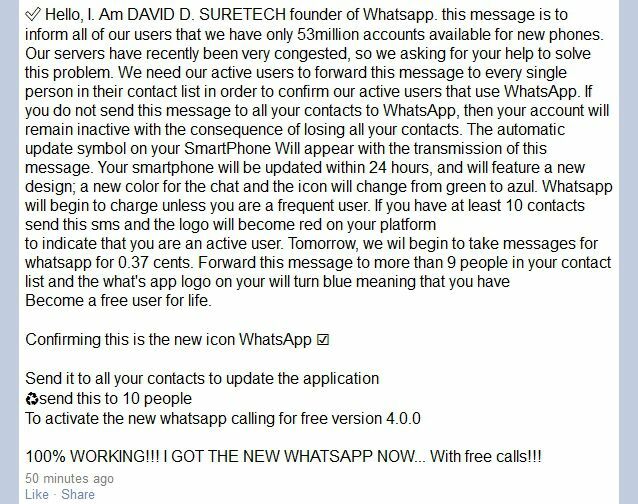 Am DAVID D. SURETECH founder of Whatsapp. this message is to inform all of our users that we have only 53million accounts available for new phones. Our servers have recently been very congested, so we asking for your help to solve this problem. We need our active users to forward this message to every single person in their contact list in order to confirm our active users that use WhatsApp. If you do not send this message to all your contacts to WhatsApp, then your account will remain inactive with the consequence of losing all your contacts. The automatic update symbol on your SmartPhone Will appear with the transmission of this message. 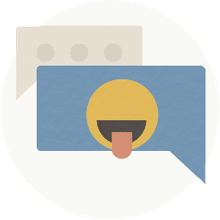 Your smartphone will be updated within 24 hours, and will feature a new design; a new color for the chat and the icon will change from green to azul. Whatsapp will begin to charge unless you are a frequent user. If you have at least 10 contacts send this sms and the logo will become red on your platform to indicate that you are an active user. Tomorrow, we wil begin to take messages for whatsapp for 0.37 cents. Forward this message to more than 9 people in your contact list and the what's app logo on your will turn blue meaning that you have Become a free user for life. 100% WORKING!!! I GOT THE NEW WHATSAPP NOW... With free calls!!! Whatsapp is shutting down on 28th jan Message from Jim Balsamic (CEO of Whatsapp) we have had an over usage of user names on whatsapp Messenger. We are requesting all users to forward this message to their entire contact list. If you do not forward this message, we will take it as your account is invalid and it will be deleted within the next 48 hours. Please DO NOT ignore this message or whatsapp will no longer recognise your activation. If you wish to re-activate your account after it has been deleted, a charge of 25.00 will be added to your monthly bill. We are also aware of the issue involving the pictures updates not showing. We are working diligently at fixing this problem and it will be up and running as soon as possible. Thank you for your cooperation from the Whatsapp team. If your WhatsApp status is error:status unavailable then you are not frequent user and by 5:00pm C.A.T WhatsApp will start charging you. To become a frequent user send this message to 10 people who receive it. Analysis: False. There are plenty of clues pointing to this being a hoax, but let's start with the most obvious and easily verifiable: the founder and CEO of WhatsApp is named Jan Koum. The company has never had a CEO named "David D. Suretech" or "Jim Balsamic." I couldn't find evidence that any real person with either of those names even exists. Moreover, this announcement, if true, would seem a rather important one, yet there has been no mention of it in the news or on the official WhatsApp blog, where important company updates are usually posted. To the contrary, the WhatsApp blog has dismissed this whole thing as a hoax. If that isn't enough, there's the boldfaced absurdity of claiming that the solution to the problem of WhatsApp's servers being "congested" -- if that were a true statement in the first place, which it isn't -- is to tax those servers even further by having every one of its users spam the same chain letter to their entire contacts list. It makes no sense at all. We are looking at one of the oldest hoaxes on the Internet, albeit updated for the 21st century. WhatsApp didn't even exist when folks first started sharing the earliest known variant of this chain letter, which said that America Online -- remember AOL? -- was going to eliminate instant messaging unless everyone who received the alert forwarded it to everyone they knew. Im's (instant messages) will be taken away on july 18. AOL has agreed to keep them if enough people want to, and every person that reads this and passes it on counts as a signature on the petition. so please read, then send to everyone you know with this same message if you want to keep the Instant message feature on America Online!! And so it evolved, into the early 2000s, through the late 2000s, and on to today. The "Facebook Is Overpopulated" hoax, which first appeared in December 2007, is still going strong, as is the "Facebook to Start Charging Membership Fees" hoax, either or both of which probably inspired the current version. It Is a Hoax. Really, It Is. Is Facebook Going to Start Charging Membership Fees? Could Facebook Be Closed for Maintenance on February 31? Is the "Talking Angela" App Stalking Your Kids?